Perennials lift carrying capacity and address water logging and salinity. Full details of this Supporting Site can be found in the following case studies. The first case study includes a financial analysis of the supporting site. Site focus: Using perennials to address salinity and waterlogging at the same time as increasing summer forage production. Pastures across the farm consisted largely of annual ryegrass and clover. However, patches of salinity and waterlogging prompted Barry to establish areas of perennials, including lucerne; tagasaste; a combination of kikuyu, summer active tall fescue and tall wheat grass and shrubs. The paddock used in the trial was significantly impacted by waterlogging and salinity was affecting the paddock across the road. Lucerne and fescue were selected with the expectation that lucerne would use up water in the upper slope and fescue would dominate the wetter areas of the paddock. A shotgun mix of lucerne and fescue was planted. The comparison paddock had been cropped in the past, but had returned to annual pasture. The paddock was sprayed out with a double knock of 1.5 L/ha of glyphosate and then sprayseed at 0.6 L/ha just prior to seeding. Following this, chlorpyrifos at 250 ml/ha and cypermethrin at 250 ml/ha was used for insect control. The paddock was sown in August 2006 using double disc openers with press wheels and after seeding 100 kg/ha of TEK Phos 2:1 (Super CZM + Muriate of Potash) was spread. The rates of seed used were 4 kg/ha of winter active lucerne (cv. Stamina GT6) and very winter active lucerne (cv. Cropper 9) Lucerne and 6 kg of Resolute (summer dormant) and Quantum (summer active) tall fescue. Establishment: Germination was excellent with a good mix of fescue and lucerne. However, managing the fescue and lucerne together was initially tricky, as lucerne emerged and grew faster than the fescue. Though it needed grazing, it had to be deferred to allow the fescue to establish. Persistence: As time went on, the fescue component declined, most likely due to the dry seasons and, as a result the lucerne dominated to make up 95% of the perennial component. This is consistent with results from Albany EverGraze Proof Site in Wellstead, where summer active tall fescue did not survive the dry seasons. Increased stocking rate – Over the two and a half year monitoring period, the lucerne provided 1638 more DSE grazing days than the annual pasture. The average winter spring stocking rate was 12.3 DSE/ha for the kikuyu vs. 8.5 DSE/ha from the annual paddock. The summer/autumn stocking rate was 9.25 DSE/ha for kikuyu vs. 4.2 DSE/ha for the annual paddock. It is clear that on this site the lucerne provided far more grazing days; however it is important to note that the stock were provided with a oat/lupin supplement as the paddock was used to finish lambs. Finishing lambs – The response of lucerne to summer rainfall has been crucial, providing a great finishing system for lambs. High quality feed was able to be produced out of season which, when combined with additional supplements of oats and lupins, enabled a large number of lambs to be turned off. This is also consistent with Albany Proof Site, where including lucerne or chicory in the system was beneficial for growing out lambs to finishing weights. 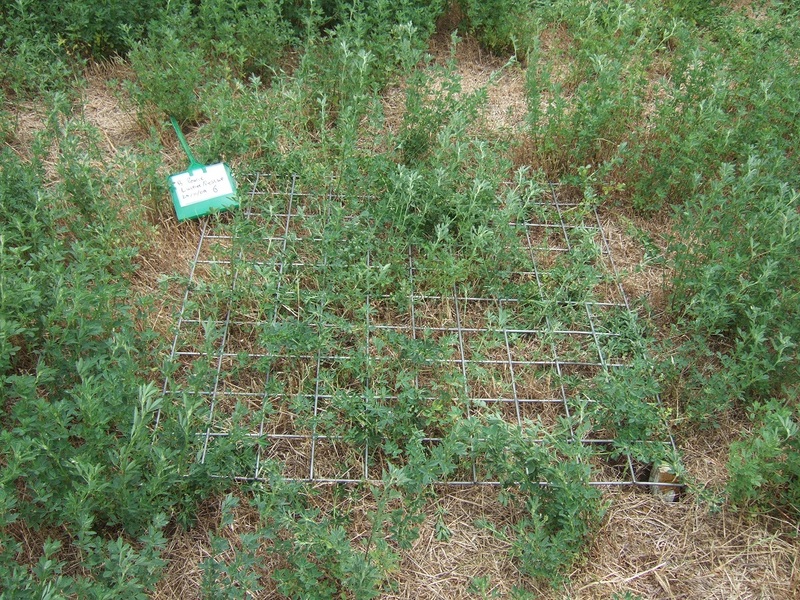 Environmental benefits – Barry noticed that the paddock was significantly drier as a result of the lucerne using up water. A positive effect on salinity is also expected through this result. Groundcover was also maintained above 70% which is sufficient to control wind erosion. Thanks are extended to Barry and Genie Pearce for hosting the site. This site was supported by the Department of Agriculture and Fisheries WA, and Future Farm Industries CRC through the National EverGraze Project.